Africa is coming to Oakland this weekend. The Umoja Festival celebrates three successful years this Saturday in Lowell Park with two stages, music, dance, art, vendors, the only inter-African soccer tournament in the Bay, and a youth soccer clinic. The secret ingredient behind the scenes? Effie Tesfahun. The festival’s project director, Effie is a local leader in community-based economic development through a focus on communities of the African diaspora and the arts. The vision of creating a festival which could celebrate Pan-African unity first came to Effie when she moved to Oakland many years ago. She credits the Town with teaching her the way to create such a festival, whose goal is “to inspire a mutual understanding and cultural dialogue through the celebration of music, art, and physical wellness.” Already having tripled their attendance from the first Umoja in 2013, this year promises to show even more exponential growth with an impressive line-up of artists, including Addis Gold Band, Nu Dekades, Jah’Mila, Piwai, Samba Guisse, Tsedi, DJs Emancipacion, Nina Sol, Mena, K-la-V, and Mpenzi, and dance companies Shabbal, Iron Lotus and SambaFunk! – all hosted by Master of Ceremonies Jennifer Johns – along with children’s art activities, African food and of course, the SuRu soccer tournament. 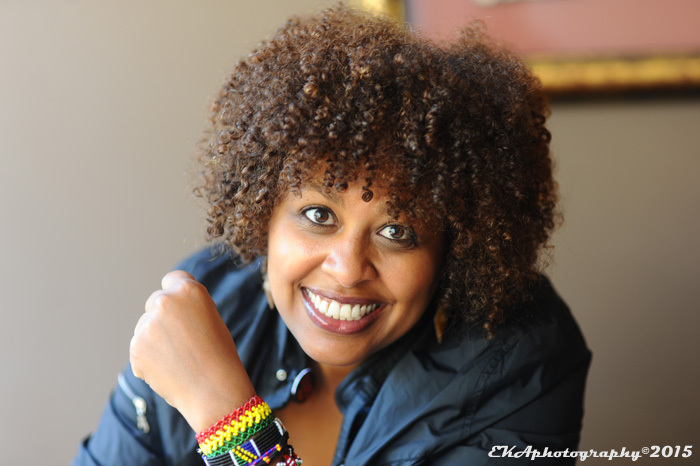 Effie was born in Addis Abba, Ethiopia and grew up in Nairobi, Kenya. 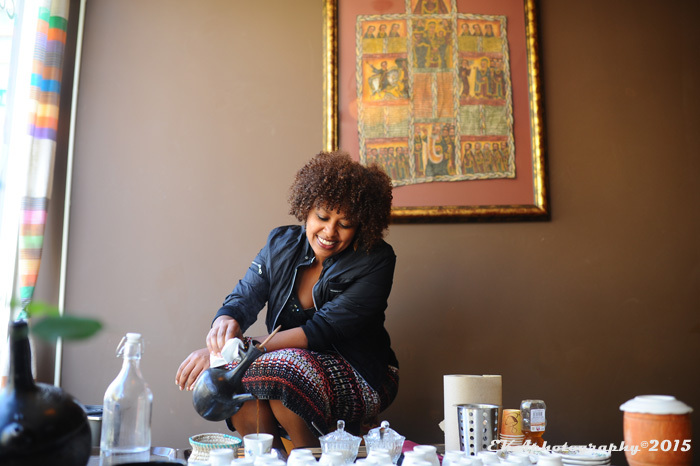 She moved to the Bay Area as a young woman eighteen years ago and later brought her parents and sister, local DJ and musician Tsedi Tesfahun, with her. She has a degree in Business Administration and over the years has curated many community events such as “Oakland in the Black,” an effort to support local businesses and sustainable development. A community organizer committed to cultural knowledge and nurturing the development of African communities here in Oakland, Effie recently returned to Africa, where over the course of five months she traveled throughout Ethiopia, Kenya, Rwanda, Tanzania and South Africa. 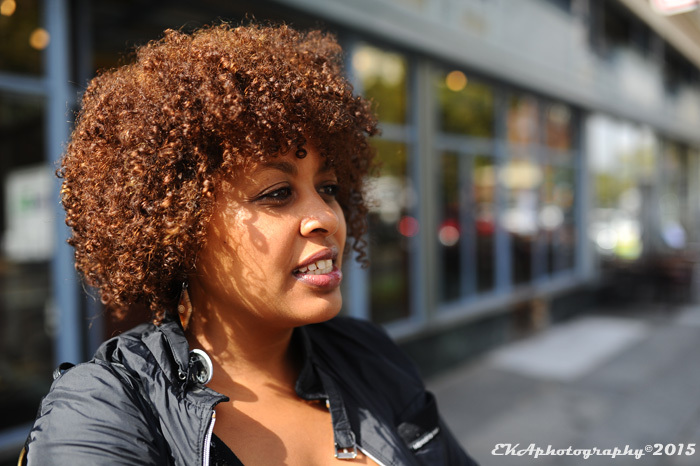 For Effie’s photo shoot for this article, Oakulture met her at the intimate Ethiopian restaurant and cafe Anfilo, near the corner of Broadway and Grand, while the owner roasted and prepared traditional coffee beans. Coffee drinking itself is a beloved and sacred ritual originating in Ethiopia. Well-rooted in a culture that honors the love and importance of sharing, Effie explained the meaning of sustainable community: “A Gursha is the act of feeding another from one’s own plate as a symbol of love and respect. A selfless dining etiquette epitomizing community and the need for us to give of what we have.” Effie’s parents had a food booth named Gursha selling injera (traditional Ethiopian flatbread) during the early First Friday years — the booth is rumored to be returning soon as TeruTesfa (their names combined to mean “Good Hope”). Effie now shares some of her inheritance in the saying, “those who eat from the same plate will not betray each other.” With an understanding of this recipe for both community development and sharing space, Effie leads through modeling community engagement and giving what one loves. Usually most comfortable behind the scenes, Oakulture was able to learn a bit more about what feeds this woman’s remarkable spirit. Oakulture: You were born in Ethiopia and spent time in Kenya before coming to Oakland. What does Pan-Africanism mean to you? Effie Tesfahun: Pan Africanism to me is the idea that those of us within the African diaspora function more as a unit, regardless of where our birth happened. Many of us have similar struggles, but what we have in common is even more and it is beautiful. Oakulture: You recently returned to Africa for several months. What new perspectives do you bring back to your life in Oakland from those travels? 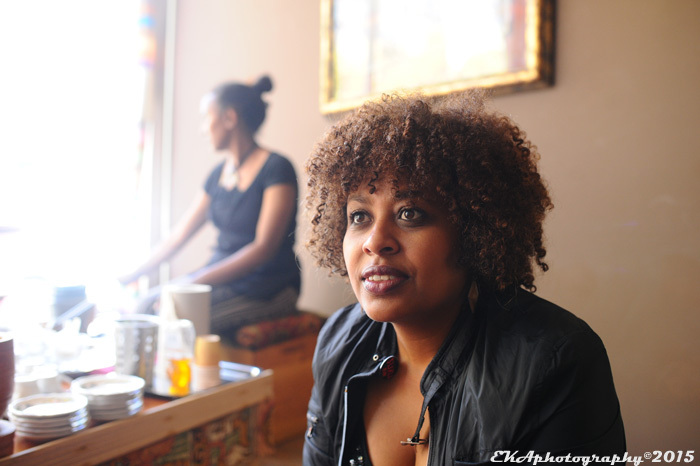 Effie Tesfahun: I think more than new perspectives, what I bring back is a renewed energy. My trip back encouraged me to do more for my community and even more to continue to support and uplift my people. I was so uplifted by the people I met through my travels and so many spoke of the idea of unity and collaboration. Oakulture: Since 2012 you have organized “Oakland in the Black,” encouraging local holiday shopping to support independent businesses. What is your perspective on what is needed for economic development in Oakland, particularly for small and micro-businesses to thrive and expand? Effie Tesfahun: I’m not the first nor the last to really focus in on small businesses, but supporting small/local businesses is a way to create a more sustainable economy. When a group of people got together to start “Oakland in the Black,” it was not only to support independent businesses but to support the black-owned businesses in the area, and even since 2012 we have seen a big decline in black-owned businesses in the downtown area. If we can be there to support our own growth then we don’t rely on some big corporation for our livelihood. Oakulture: What led you into organizing and promotion? Effie Tesfahun: Oakland was the inspiration to any organizing that I’ve done or been a part of. This town is so inspiring and people here don’t just sit and watch, but actively participate in their communities. I’ve learned and grown a lot by living here. I’ve always been a passionate person, but to be able to actively do something that actually helps or supports my passions is something I’ve learned here in Oakland. Oakulture: Why did you start Umoja and what does unity mean to you personally? 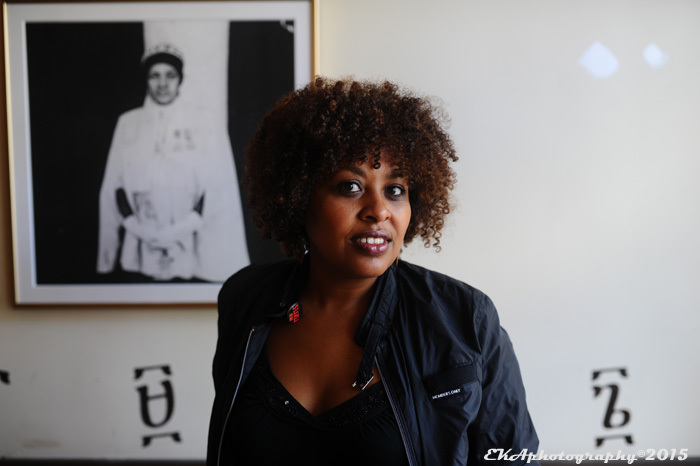 Effie Tesfahun: Umoja was an idea I had when I first moved to Oakland, but didn’t see how it could happen even though I was always encouraged to do it. I wanted to see more events that brought various African cultures and flavors and sounds and to celebrate our diversity and beauty. I didn’t know how to even begin and start organizing an event back then, but in 2013 I was ready and with a team of six we got it going. I wished for a space where I could be Kenyan and Ethiopian at the same time. I wanted to collaborate, laugh with, eat with, dance with and work with my people all at the same time. Unity to me is where we can come together despite our differences and see more of our likeness. Where we drop the stories that are told to us and tell our story. Oakulture: How has Umoja grown since its inception three years ago and what can we expect from it this year? Effie Tesfahun: Umoja has really grown since the first year. We’ve had an increase in attendance that’s tripled since 2013. This year we have a similar concept to last year, except we have more than one stage and will have more dance elements and more of our wonderful local artists and DJ’s. We are excited about how each year we add more elements of the various cultures within the diaspora. We get to meet more people each year that come from the various communities and to collaborate with groups that we did not know about last year. Our vendors, food and artisan, will wow you with all the colors and flavors of African cultures. To be African is to love family, and I can’t tell you how I’m so humbled by our elders and youth and all the love that they have given us. There will be a soccer tournament for adults, soccer clinic for youth, a youth-run arts booth, various non-profits within the community that do really great work, and so much more . . .
Oakulture: You work closely with both Stephani McGrath and your sister Tsedi Tesfahun as the ladies of Umoja. What have you learned from working closely with other women in a community context? Effie Tesfahun: Working with women as a sisterhood is one of the most amazing experiences. We lead with compassion and heart. While this sometimes can make it a challenge for business, it helps with what the goal is at hand for this event in particular. Umoja is about love and is about heart, so we get to infuse the part in us that comes so naturally, to the spirit of the event. Oakulture: Who are your role models and why? Effie Tesfahun: Honestly I would have to say my role models are my parents. My parents dedicated their lives in service to people. Their faith in God is what fueled their lives and work. They have risked their lives because of their faith and God never let them down. They raised us to love and respect all of God’s creations and to believe in the purpose that was placed in each of us. We were always encouraged to dream big and to be proud. They encourage me and all the things that I do, even if at times it may seem like I’m making a mistake. Their love and prayers always keep me together. Oakulture: Any Oakland projects you are particularly excited about right now? Effie Tesfahun: This question is a tough one, there is always so much exciting stuff that happens in Oakland. I think what I was recently most excited about is the EMS Corps project that I learned about. These guys will actually be at the festival on Saturday, but this program really touched me. Lowell Park, 1180 14th St.
Get to know the women previously highlighted in the series, including Candi Martinez, Chaney Turner, Nina Menendez, Gina Madrid aka Raw-G, DJ Zita, Soulovely crew Lady Ryan, Aima the Dreamer and DJ Emancipacion, Ramona Webb, Naima Shalhoub, Joanne Ludwig and Tracie Collins. Categories: OakQ&A, Women Runnin It | Tags: African Diaspora, Economic Development, Effie Tesfahun, Lowell Park, Oakland Festivals, Oakland in the Black, Pan-African, The Umoja Festival, Women Runnin It | Permalink.